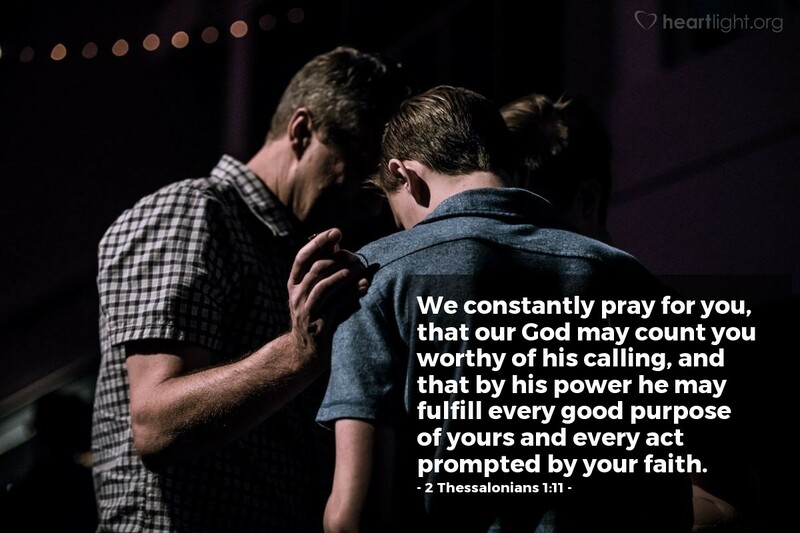 We constantly pray for you, that our God may count you worthy of his calling, and that by his power he may fulfill every good purpose of yours and every act prompted by your faith. Paul prays for God to be active in the lives of these new Christians — to maximize the good they intend to do as well as fully bless every good deed they do out of their commitment of faith. What new Christian do you need to pray this for? Strong and mighty Father, please bless several new Christians who are on my heart today. Help them recognize your presence in their lives. Please maximize the good in every effort they make and every intention they have to honor you and bless your people. Protect them from the evil one. In Jesus' name I ask this blessing. Amen.